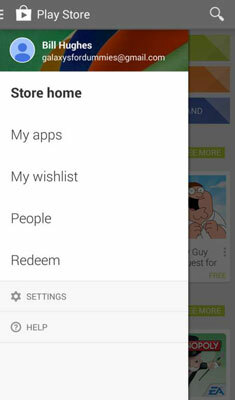 For applications in general on the Samsung Galaxy S 5 and games in particular, the Play Store is a free market. When you come in to the Play Store, your best path to finding a good purchase is to read the reviews of those who have gone before you. Although more than a million users have commented on Angry Birds, most games do not have that kind of following. One could argue that your opinion would not move the overall rating for a frequently reviewed game like Angry Birds. The same cannot be said for other games. 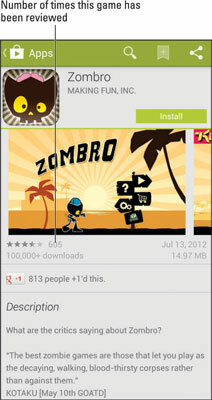 One of the suggestions is the game Zombro in the Zombie genre. The game description for one of the games, Zombro. A Description page, before you download it to your phone, will have the option to Install; the feedback areas will be grayed out. The Description page after you download it to your phone with offer the options to Open or Uninstall, and the feedback areas will be active. As of this writing, Zombro has been reviewed by 605 gamers. Your opinion matters more for this game than for the heavily reviewed games. 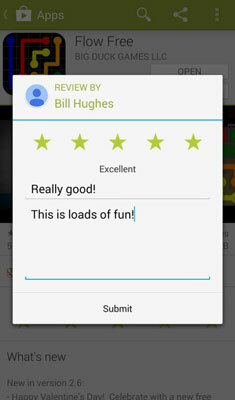 After you’ve downloaded and played a game, you can help make the system work by providing your own review. 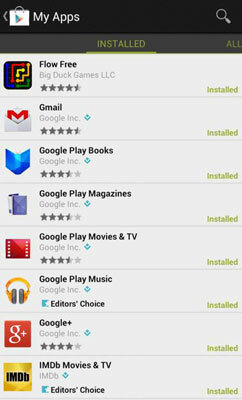 Tap the three-bar icon to the left of the Play Store logo. This brings up a pop-up. This brings up the applications that you’ve downloaded. The Play Store does not distinguish between games and apps. They’re all in the same list. Tap the game for which you’d like to leave feedback. Tapping the title of the game normally brings up the game description. 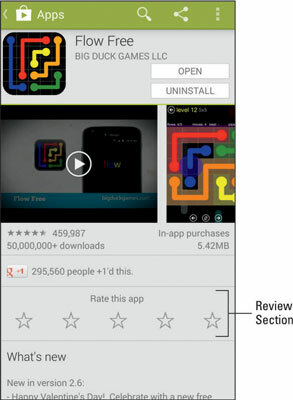 After you’ve downloaded a game, however, a Rate & Review section appears that lets you leave feedback. Tap the stars on the screen. This brings up a pop-up screen before entering feedback. Tap the number of stars that you believe this game deserves. The right side shows the result for a five-star review. You then make a name for yourself and enter any comments. You cannot enter comments without first choosing the number of stars for this game. When you’re done, tap OK. Your comments are sent to the Play Store for everyone to see. For the sake of the system, make sure that your comments are accurate!